On January 24, 2019, His Holiness Patriarch Mor Ignatius Aphrem II presided over thanks prayer at Oum Al-Nour (Mother of Light) Church in Ankawa, Iraq. 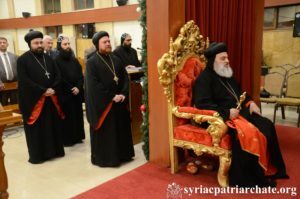 Their Eminences: Mor Nicodemus Daoud Sharaf, Archbishop of Mosul, Kirkuk, Kurdistan and Environs , Mor Timotheos Moussa Al-Shamani, Archbishop of the Archdiocese of Mor Mattai Monastery, Mor Timotheos Matta Al-Khouri, Patriarchal Vicar for the Patriarchal Archdiocese of Damascus, along with the clergy and a crowd of faithful attended the prayer. At the end, His Holiness blessed the faithful. A reception in honor of His Holiness was then organized by the parish.